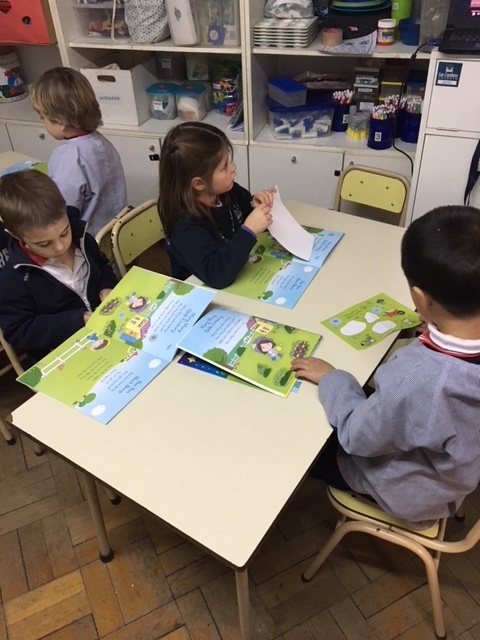 On Thursday we worked with our new STICKER BOOK! 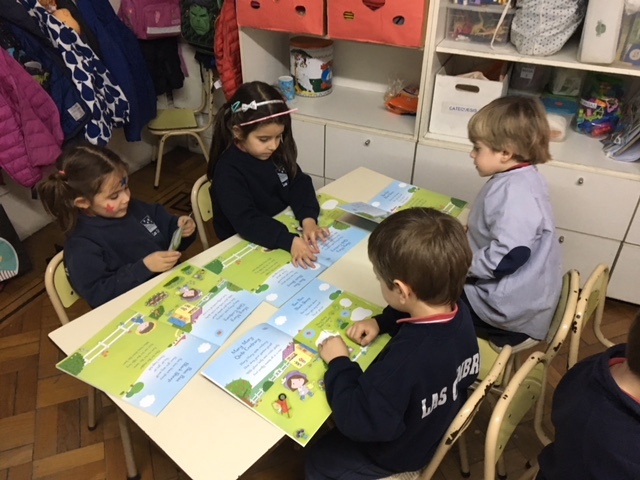 We are going to learn lots of NURSERY RHYMES to share with our family and friends. 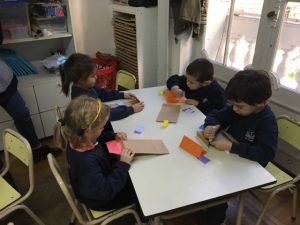 ÉSTA ÚLTIMA SEMANA DE CLASES ESTUVO LLENA DE MOMENTOS LINDOS. FESTEJAMOS EL CUMPLE DE DELFI CON UNA MEGA TORTA DE ARCO IRIS, ELLA ESTABA MUY FELIZ. SEGUIMOS HACIENDO COSAS PARA NUESTRO FASCÍCULO, ESTA VEZ LOS CHICOS BUSCARON, MARCARON Y CALCARON LOS PAÍSES DEL GRUPO “D”. ESTÁ QUEDANDO BUENÍSIMO, TODOS ESTAMOS APRENDIENDO MUCHO. 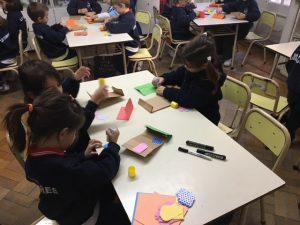 Y COMO CIERRE DE ESTA PRIMER ETAPA COMPARTIMOS UN PICNIC LLENO DE COSAS RICAS Y JUGAMOS AL JUEGO DE LA SILLA. ¡FELICES VACACIONES CHICOS, NOS VEMOS A LA VUELTA! 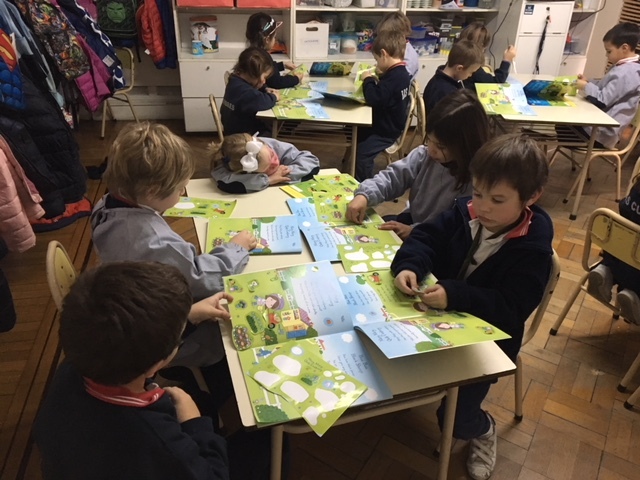 ESTAS SEMANAS EN KINDER 5 ¡HICIMOS DE TODO! 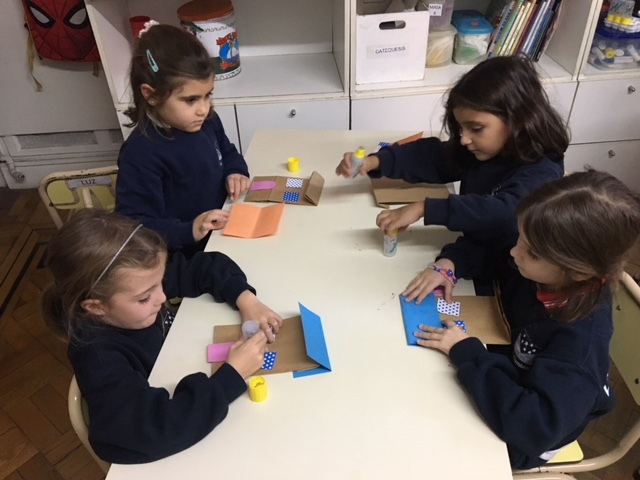 ESTUVIMOS EN EL LABORATORIO, EXPERIENCIA QUE LES ENCANTA A TODOS, HACIENDO BURBUJAS CON UNA BOTELLA, UNA MEDIA, DETERGENTE Y AGUA. TAMBIÉN USARON ALAMBRES Y SORBETES, PERO LA QUE MÁS LE GUSTO FUE LA DE LA MEDIA. POR OTRO LADO COMENZAMOS CON EL ARMADO DEL FASCÍCULO DEL MUNDIAL. LOS CHICOS ELIGIERON POR GRUPOS EL PAÍS QUE MÁS LES INTERESA INVESTIGAR. SELECCIONARON LA INFORMACIÓN QUE HABÍA EN LA SALA Y LA REGISTRARON EN UNA HOJA. UNOS GENIOS COMO TRABAJARON TODOS. ¡FELICITACIONES! LES DEJAMOS LAS FOTOS Y VIDEOS DE TODO LO QUE HICIMOS Y EL FESTEJO DE SOFI CON ESA MEGA TORTA. ¡BUEN FIN DE SEMANA PARA TODOS! OI VINIEON LOS AUELOS A CLEBRAR L DIA LA BANDERA. LO QUE MÁS NOS GUSTÓ FUE HACER CON ELLOS LAS BANDERAS. 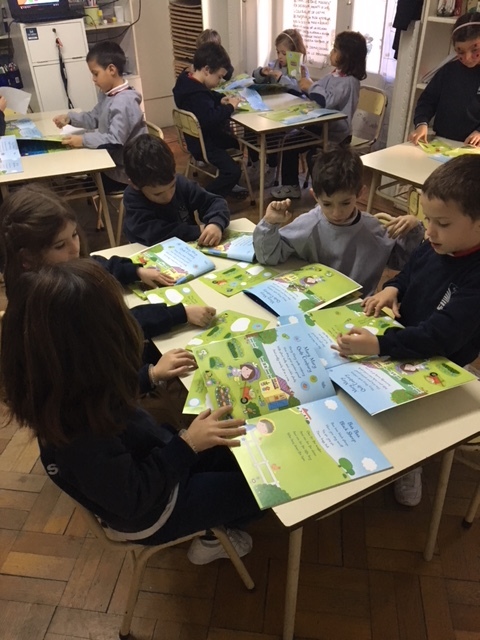 ME GUSTÓ QUE COMPARTAMOS EL COLEGIO CON LOS ABUELOS. ME GUSTÓ QUE LE DIMOS ESE SEÑALADOR. ME GUSTÓ RECORDAR LA BANDERA CON ELLOS. 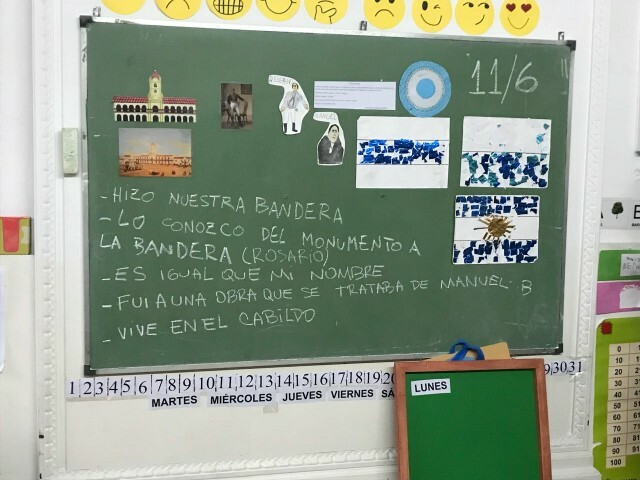 CONTARLES SOBRE LA ISTORIA DE LA BANDERA. LES CONTAMOS LA HISTORIA DE MANUEL BELGRANO Y VIMOS “LA ASOMBROSA EXCURSIÓN DE ZAMBA EN EL MONUMENTO A LA BANDERA”. PINTARON, RECORTARON Y ARMARON UN ROMPECABEZA DEL CREADOR DE LA BANDERA. RECORTARON EL MATERIAL PARA EL DÍA DEL TALLER CON LOS ABUELOS. Y VIERON LA OBRA: “MONDONGO PARA MANUEL”. 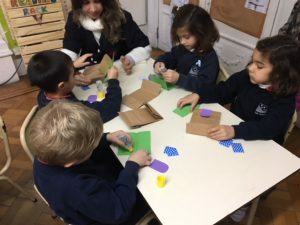 LOS CHICOS EN CASA LES PUEDEN CONTAR TODO LO QUE APRENDIERON. 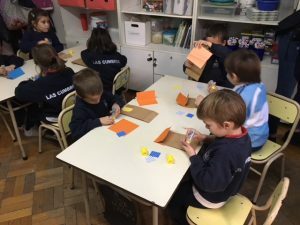 FALTAN 2 DÍAS PARA EL TALLER…¡QUÉ EMOCIÓN! LA SEMANA PASADA LOS CHICOS PARTICIPARON DE UN TALLER DE ARTE Y LO DISFRUTARON MUCHÍSIMO. PRIMERO TUVIERON QUE APLASTAR LA ARCILLA DENTRO DE UNA BANDEJA, HASTA QUE QUEDE LISA. LUEGO CON UN CLAVO HACÍAN UN DIBUJO Y SI NO LES GUSTABA O ALGO NO LES HABÍA SALIDO COMO ESPERABAN, SÓLO CON MOJARSE LOS DEDOS PODÍAN BORRARLO Y VOLVER A HACERLO. AL DÍA SIGUIENTE KARINA Y SU AYUDANTE VOLVIERON PARA QUE LOS CHICOS FINALICEN SU OBRA PINTÁNDOLA CON COLORES FLUOR. ¡UN APLAUSO PARA ESTOS ARTISTAS! ¡PERO SEGUIREMOS INTENTANDO, APRENDIENDO Y DIVIRTIÉNDONOS! 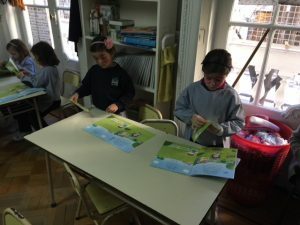 BIENVENIDOS UNA VEZ MÁS A UNA NUEVA PUBLICACIÓN DE KINDER 5. DURANTE LAS ÚLTIMA SEMANAS LOS CHICOS COMPLETARON EL ÁLBUM DE FIGURITAS DE LA SALA Y YA ESTÁN INVESTIGANDO PARA EL PRÓXIMO PROYECTO: “USOS Y COSTUMBRES DEL GRUPO D Y RUSIA”. A CONTINUACIÓN PODRÁN VER A ALGUNOS DE LOS CHICOS EXPONIENDO FRENTE A TODOS SUS AMIGOS LO QUE INVESTIGARON EN CASA. YA SE PALPITA EL MUNDIAL Y ELLOS LO SABEN, ESTÁN MUY ENTUSIASMADOS Y CON GANAS DE APRENDER. ¡MANOS A LA OBRA! Last week we made beautiful houses where to put our FAMILY FINGER PUPPETS (mother, father, brother, sister and baby). 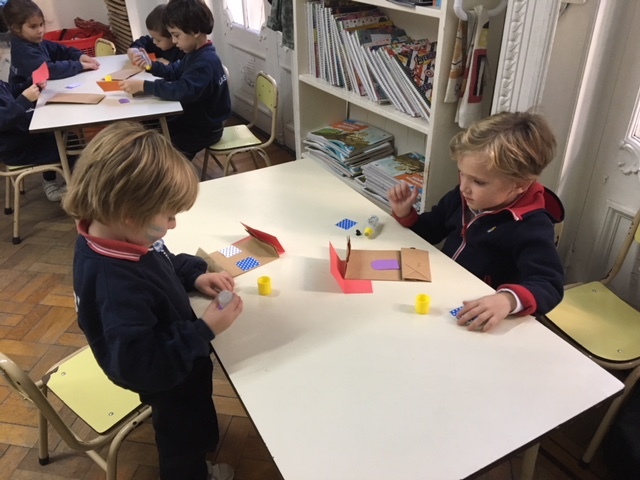 We decorated these houses with a ROOF, two WINDOWS and a big DOOR. We also sang the FAMILY FINGER SONG! 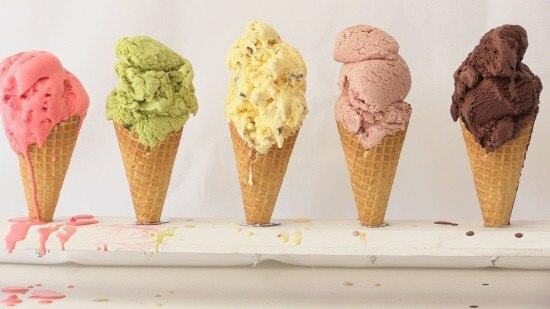 we enjoyed it very much! !